新着情報　/　What's new ! X-ray or neutron diffraction (scattering) analysis of biologically important systems such as DNA transcription / recombination / repair / replication / translation and intracellular signal transduction is of particular importance to elucidate the structure-function relationship of the biological systems in living cells. 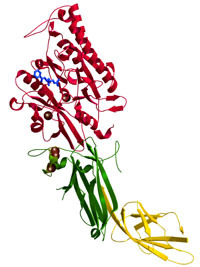 Our ultimate goal is to understand the protein-protein, protein-nucleic acid or protein-lipid interactions from the high resolution crystal structure analysis and the time-resolved solution scattering analysis, and to establish general principles for architectures of biological supramolecular complexes to describe the physical chemistry of these cellular functions.